You are here: Home / Recipes / Cakes, Cookies and Baking / Easy Apple and Plum Pastry Slice. Easy Apple and Plum Pastry Slice. 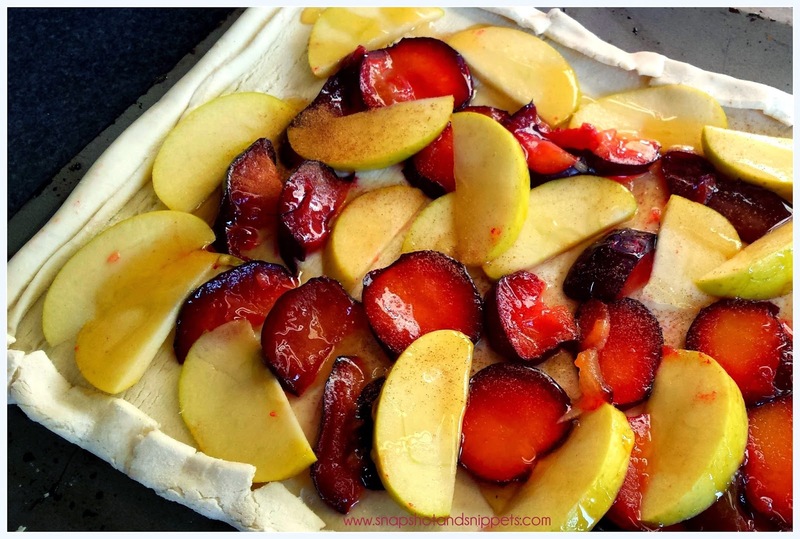 What we Eat Wednesday and I am keeping with the Apple theme with this easy to make Apple and Plum Pastry Slice. I love using Puff pastry and it is so easy to get hold of now in Supermarkets. Defrost your puff pastry the night befor , you can be brave and make your own but this is the easy recipe. Roll out the puff pastry and either score about 1/2 inch in from the edge with a knife or roll in the edge and brush with melted butter. Slice your Apples and Plums finely and layer on top of the pastry and drizzle with Honey or Maple Syrup. Finely sprinkle cinnamon on top of the slice and place in a pre-heated oven for 25 mins or until buy doxycycline rx pastry is golden. When out of the oven and cooled slightly, sprinkle with icing sugar and serve with whipped cream. If you enjoy my family friendly recipes you can find more of them on my new Recipe Page, or you can sign up for my Snapshot and snippets newsletter and get your copy of the Free Snapshot and Snippets recipe Ebook. This looks sooo tasty! I love the combination of flavors, I'll have to try this. My hubby would love this, anything with fruits, are his favorite.